In his highly anticipated new book, David Garland explores what keeps the death penalty alive in the United States. David Garland was scouting for his next research subject when he came upon an extraordinarily disturbing exhibit at the New York Historical Society: “Without Sanctuary: Lynching Photography in America.” The photographs, taken from the 1890s to the 1940s, captured images of “what looked like medieval public executions performed in front of large crowds,” he recalls. Although Garland is an expert on crime and punishment—he published The Culture of Control: Crime and Social Order in Contemporary Society in 2001—he nonetheless was unaware that such public executions had occurred so recently in America with the cooperation of local law enforcement authorities. “Lynchings were seen as illegal and therefore not part of state punishment, but that is a mistake,” says the Scotland native. While they might have violated federal and state laws, “local law enforcement officers and judges colluded and often handed over the prisoner to the lynch mob,” he said. Garland, Arthur T. Vanderbilt Professor of Law, wondered whether the idea of a “local legal system” had applications to another historical anomaly he had been thinking about: America’s death penalty. Although most Western countries abolished the death penalty long ago, capital punishment persists in America. Why? 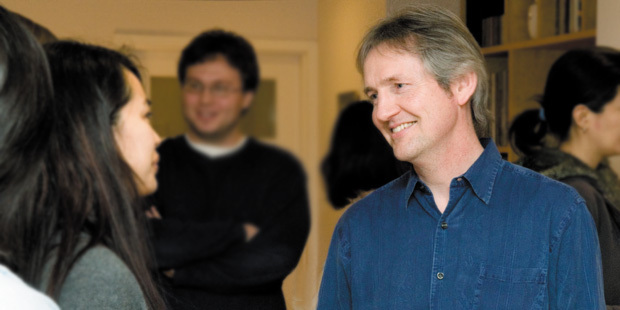 In 2006-07, Garland won a prestigious John Simon Guggenheim Fellowship to pursue this question. His answer can be found in his latest book, Peculiar Institution: America’s Death Penalty in an Age of Abolition, from Harvard University Press. Using the lenses of a sociologist and historian, Garland sets out to answer three puzzling questions: 1. Why has America diverged from other Western nations in retaining the death penalty? 2. How has the death penalty acquired its strange contemporary forms? And, 3. Why does America spend so much time, money, and effort maintaining a system that is so inefficient? While 12,000 homicides are committed every year, just over 100 convicted murderers are sentenced to death, with one-third of that group eventually executed after 12 years of appeals. “It seems obvious that the death penalty is primarily about politics and culture, symbolism and gestures, and much less about crime control,” says Garland. 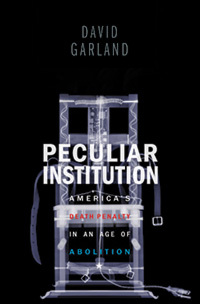 Garland also traces the history of Supreme Court capital punishment cases, including Furman v. Georgia (1972), argued by Anthony Amsterdam, now a University Professor at NYU, which led to a moratorium, and Gregg v. Georgia (1976), which lifted the ban. This litigation led to safeguards against arbitrary executions, but it also produced layers of legal process that rendered them less effective. The U.S. death penalty is now an attenuated system of delays, deferrals, and inordinate expense.